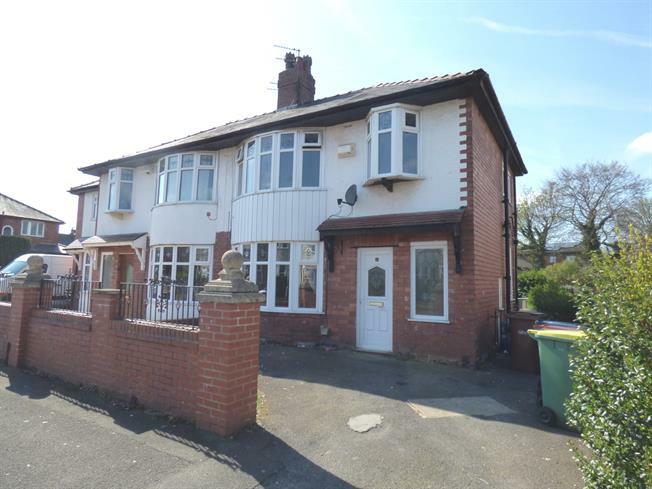 3 Bedroom Semi Detached House For Sale in Preston for Asking Price £129,950. Extended three bedroom semi detached family home offering no chain delay. Situated within a popular location offering easy access to local amenities, schools and transport links. The spacious accommodation briefly comprises; hall, lounge thru into dining room, kitchen and utility room, to the first floor, three bedrooms, bathroom and separate wc. Double glazing and gas central heating system, gardens to the front and rear, driveway. Call now to arrange your viewing on 01772 823021. UPVC door to the front, radiator and staircase leads to the first floor landing. Double glazed bay window to the front, wood mantle with electric fire and radiator. Double glazed patio doors leading onto the rear gardens. Double glazed window to the side, range of wall and base units with complementary work surfaces, gas cooker point, space for washer, part tiled walls and radiator. UPVC door and window to the rear. Double glazed bay window to the front and radiator. Double glazed window to the rear, bath with shower over, wash basin with vanity unit, tiled walls, radiator, boiler. Double glazed window to the side and low flush wc. Driveway to the front providing off street parking and low wall enclosed gardens to the front. To the rear is a fence and hedge enclosed garden with lawn and shed.